“Direct “seats” on planes into Cape Town have soared by half a million and generated R3bn in direct tourism spend for the province,” said Business Day yesterday. Community-based tourism happens when local residents create an offering and invite tourists to visit their communities. The offering can include accommodation, eateries, historic tours, arts and crafts, to name but a few. For the entrepreneur or artist, community tourism can be a wonderful source of income. Yes, tourists are interested in the big attractions, Table Mountain, Robben Island, the acclaimed restaurants, established wineries… but they also want to meet the locals, experience the real culture and food and ways of the community. There are a few existing community tourism projects. South African Tourism has a few initiatives (read more) and here in the Cape Winelands, the two main tourist towns of Franschhoek and Stellenbosch both have something on offer for visitors who would like to go beyond the normal tourism offering. This route includes accommodation, activities, arts and crafts, food and drink and extends to services such as catering and carpentry. In the picturesque Franschhoek Valley, visitors have the option to join either a guided tour of Franschhoek Rond en Bont or they can visit the local participants on an individual basis. Options include, among others, a home kitchen serving traditional meals, a welcoming tea garden with delicious home-baked treats, a chocolate factory, pottery studio, live entertainment and traditional beer (Umqombothi) as well as tours of medicinal herb gardens, historic monuments and even a crèche! These initiatives are wonderful and the people behind them are passionate and dedicated. They do need help though. It is not about turning the charming little tea garden into another commercial enterprise. The attraction is in the fact that the offering might be a bit rustic, but that it is authentic. To be successful these tourism entrepreneurs do however need the help of tourism bodies and those involved in the industry to ensure they create awareness of their offerings, to have a system for administration and finances and to guarantee safety and peace of mind for tourists when they visit more rural areas and offerings. With a little help, community tourism can become more than an initiative – it can become a sustainable industry. Featured image: Ruth Paulse runs her own tea garden as part of Franschhoek Rond en Bont. 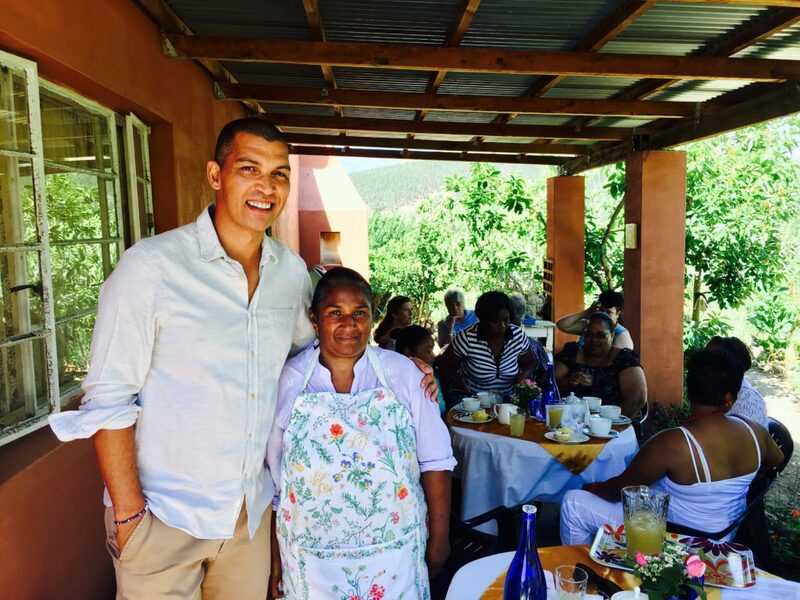 With her is renowned chef and Franschhoek local, Reuben Riffel, who supports the development of community-based tourism. Ruth invites tourists to her house for tea and delicious home-baked treats. She uses the produce from her herb, fruit and vegetable garden for her cordials, teas, cakes and tarts.